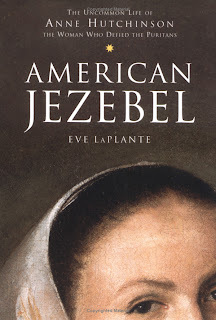 Boston, Mass - How thoughtful that my book club chose to read American Jezebel, the biography of Anne Hutchinson written by Eve LaPlante, while I am in the midst of writing the Boston City Guide. Here is a little local history. Anne Hutchinson was a Purtian woman who was expelled from the Massachusetts Bay Colony for disparaging some of the ministers and encouraging others to establish a direct relationship with God. In short, she was a real troublemaker. And the fact that she was a woman raising all this ruckus was even worse. Anne Hutchinson was brought to trial because she was such a charismatic and persuasive teacher and preacher. Of course, as a woman, she could not preach from the pulpit. But she did conduct informal discussion groups in her home, where she would explain and elaborate and - yes - sometimes contest the ministers' sermons. That said, Eve LaPlante makes it clear that Anne Hutchinson was not brought to trial because of her beliefs, for the doctrinal differences were so minor as to be almost incomprehensible to the non-Puritan. Believe me, the book includes much of the transcript of the trial... incomprehensible. Anne Hutchinson was brought to trial because she was perceived as a threat to the stability of the young Massachusetts Bay Colony. She was encouraging her followers to pursue a relationship directly with God, disputing the infallibility of the ministers as middlemen. It would be dangerous if a man were to espouse this point of view. Some did, resulting in political battles. But to have a woman make these claims was insupportable, and Governor John Winthrop knew that he had to find a way to get rid of her. 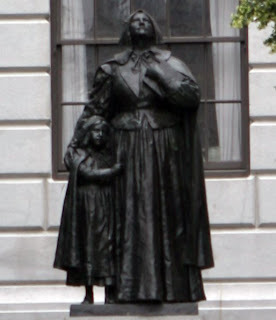 Banished from Massachusetts, Anne Hutchinson went down to join Roger Williams in Rhode Island. This free-thinking and religious liberal had been living down there by himself with the natives. But when Anne showed up, she brought her large family and many of her followers - and so Rhode Island was founded. One of the first written rules in Rhode Island was as follows: "No person within the said colony... shall be in any wise ways moldested, punished, disquieted or called into question for any differences in opinion in matters of religion, and do not actually disturb the civil peace of our said colony; but that all and every person... may freely and fully have and enjoy his and their own judgments and consceinces in matters of religious concernments..."
In fact, there was no formal church in early Rhode Island, as individuals went about their religious life in a more private way. Anne was free to hold informal gatherings to read and discuss the Bible, but there was no church building or hierarchy. Eve LaPlante points out that the ideas and language of the Rhode Island charter contribute directly to the First Amendment of the US Constitution, which states that "Congress shall make no law respecting an establishment of religion, or prohibiting the free exercise thereof." Anne Hutchinson, LaPlante argues, laid the groundwork for the relgious tolerance that we enjoy today. The question arises about whether or not Anne Hutchinson was a feminist. I mean, she did not believe that women should have the same rights and priveleges as men. She raised 16 children and nobody heard her complaining about that! She was not advocating to change the situation of women in her society. But actually... she was. She believed that women had the right and the ability and the spiritual necessity to have a direct relationship with God, without the intermediary of a male preacher. This was a radical and decidedly feminist idea, which she defended even as it meant her banishment from the colony. She was way ahead of her time. Somerville, Mass - Well the second leg of the Tour d'Afrique is officially completed. My teammates David and Quentin arrived in Addis Ababa. Quentin amazed everybody by coming in second place in the time trial - this is not expected of the sectional riders! And David posted an entertaining and inspiring blog about his adventures (read it here). David and Quentin have passed the virtual baton to Carlo and Jim, who are currently riding a section called Meltdown Madness - scary - from Addis Ababa to Nairobi. Back in Somerville, I am having my own fair share of riding adventures. Last week, I got three flat tires in one week. My riding buddy commented that I was having bad karma, but I think it should be called "bad bike-ma". Sorry, I've been dying to share that joke. Anyway, I got the first one when I was about 15 miles from home, riding by myself (which is a rare occasion) and Jerry was out of town. It was the middle of the day on a Friday, when most respectable people are at work. So I sucked it up and called a taxi cab, which took me and my bike home for $60. Which is a tax write-off, since I am writing about it right now. I found out later I had a staple in my tire. 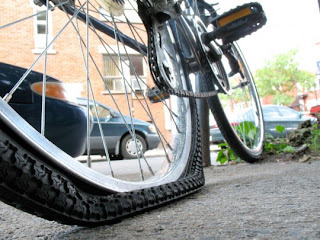 The very next day, I had not yet fixed flat #1, so I was riding my other bike, which got flat #2 when I went over a pothole. This time, I was riding with friends, who provided the tube, pump and expertise needed to change the tire, so I could actually continue riding. Two days later, it happened again. Flat #3. Same scene, except at least I was carrying an extra tube. But I still didn't know how to fix it myself. Embarrassing. This all happened in the week leading up to the first day of a bicycle maintace course that I signed up to take at my local bike shop, Broadway Bicycles. Honestly, I signed up two months ago. It was just a coincidence that I got three tires in the week before. And what do you think we did in the first class? That's right, we learned how to change a flat tire. I was the only one who actually came to class with a flat tire. I was really prepared. So now I know how to fix a flat. Which is a good thing, because when I signed up for the Tour d'Afrique I told them that I know how to do that. And now I do. In other milestones, I am very close to reaching my fundraising goal for BEN-Namibia ($2800 and counting!). I had an article published in Wheel People, the monthly newsletter of the Charles River Wheelmen. I knew that my fellow riders would be a receptive audience for this worthy cause, and they did not disappoint. Thank you so much to everyone who has donated! The generosity of my family and friends (and a few strangers) inspires me to keep riding. In our society, we tend to think about bikes as a means of recreation. But in rural Namibia, people depend on bikes to get to work, to get to school and even to get treatment for life-threatening illnesses like HIV/AIDS. I am supporting BEN in hopes of providing more bikes to more people in Namibia - a simple and straightforward way to increase access to employment, education and healthcare. So if you have not already done so, please click here to make a donation. Just because I have reached my goal is no reason NOT to give. Your donation will still go directly to BEN-Namibia. Your generosity could give somebody a job. Or allow somebody to go to school. Or even save a life. This little assignment presented a bit of a challenge, since I did not have a video camera in Moscow. You may recall that I had a similar problem last year in Venice, and I ended up hiring a professional to shoot my three-minute video audition (click here to see the final result). This time, Lonely Planet advised me to take a whole bunch of photos in Moscow, especially photos with me in them. Then I cam home and shot the video footage in my backyard and on my front porch. It was the creative minds at Lonely Planet TV that put it together into this cool clip. (10) Mary Baker Eddy founded the Christian Science movement in 1875 after recovering unexpectedly and inexplicably from a spinal injury. She was a deeply spiritual person, and she believed that human beings have healing powers that can be developed through spiritual practice. (9) Tom Cruise is not a Christian Scientist. That's Scientology. That's different. 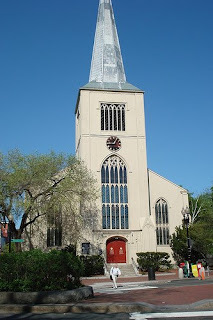 (8) Today the Christian Science Church has as many as 2000 congregations around the country, but the First Church of Christ, Scientist - the Mother Church - is right here in Boston. (7) There is no minister in the Christian Science Church. In Sunday service, lay people take turns reading from the Bible and from Mary Baker Eddy's book, Science & Health with Key to the Scriptures. (6) In 1908, at the age of 87, Mary Baker Eddy founded the Christian Science Monitor. After 100 years of daily publication, last year this respected newspaper announced that it would scale back to weekly publication of its print edition. (5) Besides being the founder of a major religion and a major newspaper, Mary Baker Eddy was also an avid abolitionist and a suffragette. What a lady! 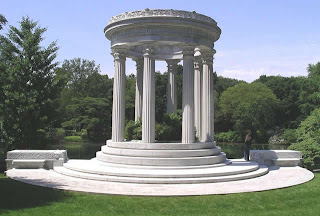 (4) She is buried in Mt Auburn Cemetery in Cambridge, Mass. 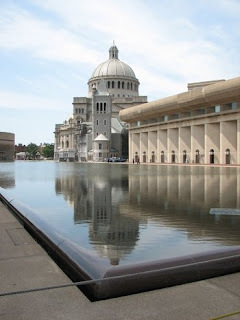 (3) The First Church of Christ, Scientist is an easily recognizable landmark in Boston. Pretty much everybody knows it. But not everybody knows about the Mapparium that is inside the Mary Baker Eddy Library nearby. This is a giant three-story glass globe, with a bridge that allows visitors to take a journey to the center of the earth. The Mapparium was created in 1935 by Chester Lindsay Churchill, who wanted to explore how ideas shape the world. It does have removable panels, which would allow the globe to be updated, but church officials soon realized the futility of trying to keep up with history. And so the Mapparium remains as a model of the world as it was in 1935. (2) Botswana used to be called Bechuanaland, while Namibia was known as the German South-West Republic. (1) One skill required of travel writers is the ability to find - when wandering around the city for hours on end - a clean functional toilet. Big, fancy hotels are always a good bet for a place to pee, as are Christian Science reading rooms. And if you're ever in Boston, the Mary Baker Library has a very nice bathroom indeed. Photos courtesy of the Mary Baker Eddy Library. Somerville, Mass - I was finishing up a few odds and ends on Eastern Europe, looking for a song about the Adriatic Sea (long story), and I came across this clip from Cheers. In case anybody needs reminding, this fantastic TV show from the 1980s used to be filmed in Boston (at what is definitely the worst bar in the entire Boston City Guide, if not the entire city). And also in case anybody needs reminding, this clip will demonstrate that Coach was definitely the funniest character on this show. Somerville, Mass - January is officially over, and so is the first leg of the Tour d'Afrique, also known as Pharaoh's Delight. The good news is that my Lonely Planet team members, Sharif Rashedi and Scott Kennedy, completed their African odysseys without dying. Not only that, they seemed to have a pretty good time of it. Now, over the next two weeks, David Else and Quentin Fraye will ride from Khartoum, Sudan to Addis Ababa, Ethiopia. Good luck, boys! I have been following the progress of these riders pretty closely, on the official Tour d'Afrique blog, and on One Cog Mind (Sharif's blog) and Adventureskope (Scott's blog). I have to admit that reading these first-hand "live" accounts intimidates me. It makes this adventure seem all the more real, all the more imminent. The first blog posts were all about average speeds and wind direction and whatnot. I can talk the talk, but the truth is that I'd rather not think about average speeds. I'm really just concerned with reaching my destination, no matter how long it takes. I expressed these concerns to Jerry, who reassured me. "You'll be fine," he said. "You're not going to die. You're probably not going to win, but you're not going to die." So that's where I'm at right now: somewhere between dying and winning. The other good news is that I am riding outside again. I am very grateful that I have the option to ride indoors on the trainer in front of the television. But the fact is that an outside ride is a better workout and a better diversion, especially when I am supposed to be logging 50 miles and up (that's three-plus hours, if anyone is counting). So my neighbors (and my husband) think I'm crazy when they see me loading my bike on the back of the car in sub-freezing temperatures… but (I assure them) it is a joy to be riding through the snowy landscape, feeling the cold air against my warm body and racking up the miles. And thank goodness for my riding buddies, who know more riding routes than Lance Armstrong, and who are kind of like mailmen in their devotion to the cause. I won't ride in a snow storm, though, which means that I still ride indoors at least once a week (nice winter we are having here in Massachusetts). So I am still expanding my movie library at a rapid rate, with films from A to B (Africa to bikes). 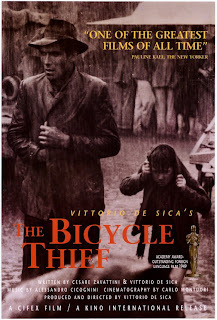 Last week I watched the Italian realist film, The Bicycle Thief. I thought this Academy Award-winning classic would be inspiring, but as it turns out it was one of the most devastating movies I have ever seen. Not that it wasn't excellent, just heartbreaking. This is not Hollywood, ladies and gentlemen. I did appreciate the bicycle theme, however. Here is the story of a guy who depends on his bike for his livelihood. He is offered a job - a rarity in post-WWII Italy - but he can't do it without a bicycle. His wife hawks her wedding linens to reclaim the bike from the pawn shop. You can see where this is going… the first day on the job and the biciclette gets stolen. We are a long way from the depression of post-WWII Italy (I hope). So I appreciated this example of somebody who relies on a bike for access to basic necessities. We tend to think of bikes as a form of recreation. In our society, some people use them for transportation, but those people are a little wacky, aren't they? And rarely are they actually dependent on the bikes as their sole means of getting to work. In rural Namibia, many people have no way to get to work (or to school, or to the hospital) unless they happen to have a bike. Healthcare workers walk many miles a day in order to visit their patients. Some kids can't even go to school because they have no way to get there. 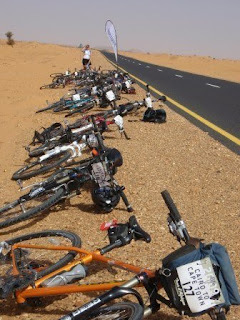 I am supporting the Bicycle Empowerment Network (BEN) in hopes of providing more bikes to more people in Namibia. The bicycle is a clean, affordable, healthy and environmentally-friendly means of transportation. More importantly, it is an accessible means of transportation. Thank you so much to everyone who has already donated to BEN. If you have not yet done so, please click here to make your donation. And if you're not sure, watch The Bicycle Thief. Your donation could get somebody a job. Or allow somebody to go to school. Or even save a life.